In January 2006, the BBC aired a radio play by John Banville entitled "Todtnauberg," which is his thought experiment speculating on that famous meeting. Interspersing the present day meeting with flashbacks detailing Heidegger's fraught affair with Hannah Arendt, the play continues John Banville's fascination with German thinkers. The cost of project (100 pounds euros) has it flying a bit under the radar – we first became aware of it via a Read Ireland mailer – and so we thought we'd drop John Banville a line and ask him a few quick questions about this project, which we both felt deserved attention. TEV: There's something awfully attractive about underreported meetings between great minds. (I'm thinking of Michael Frayn's Copenhagen as perhaps the most recent and obvious example.) What first inspired you to write about the meeting between Celan and Heidegger? JB: Well, I’ve always been fascinated by the thought of these two extraordinary figures encountering each other—the philosopher who had been a Nazi, the poet whose parents had been destroyed in a Nazi work camp—at the famous “hut” in the Black Forest. The meeting took place on July 25th, 1967, the day after a reading by Celan in Freiburg which Heidegger had attended. 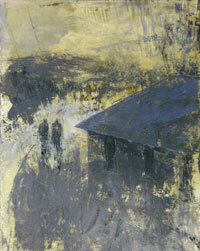 The conversation in the hut was not recorded, and neither man gave an account of it. Hans-Georg Gadamer, the philosopher, later reported that Heidegger had told him that “in the Black Forest, Celan was better informed on plants and animals than he himself was.” Besides the flora and fauna, did they talk about the war, about Nazism and Heidegger’s refusal publicly to account for, much less apologise for, his membership of the Party? I could not resist speculating. TEV: Like nearly all of your work, Conversations in the Mountains is richly allusive, beginning with the title. It's a powerful work dealing with, it seems to me, accountability, a coming to terms, and an examination of the creative act. (We see the birth of a great poem.) What would you advise a reader coming to the work with no background in the source material? JB: First of all, any reader wishing to learn about Celan should read John Felstiner’s definitive biographical study, Paul Celan: Poet, Survivor, Jew, which as well as an account of the life contains some of the finest translations of Celan’s extremely difficult poetry—Felstiner’s English version of “Todesfuge” is a triumph. For Heidegger, Hugo Ott’s biography is very thorough, though Ott is quite condemnatory, and quite rightly, of the philosopher’s murky politics. I took my title for the play from Celan’s short prose work Gespräch im Gebirg. TEV: Although you're best known as a novelist, you've done a fair amount of dramatic work – screenplays, plays, translations. What draws you to the form, which allows little of the sort of writing with which you've made your reputation? JB: I have done three “versions”—not translations—of plays by Heinrich von Kleist,The Broken Jug, God’s Gift, from Kleist’s Amphitryon, and Love in the Wars, from Penthesilea. My aim was simply to get Kleist on to an anglophone stage, since Kleist is almost entirely ignored in the English-speaking world, despite his greatness—he was determined, he said, to “rip the laurel wreath from Goethe’s brow”, and in my opinion he succeeded. These versions were interesting exercises—writing in blank verse was a challenge—and I had a good time doing them. JB: I love working in radio, love the difficulties and opportunities the medium presents. It’s wonderful to write in that hush. I’ve written two or three fiction adaptations, including Henry Green’s Loving and James’s The Spoils of Poynton, as well as some original pieces. Conversation in the Mountains was done by BBC Radio Four in a fine production with Josh Ackland as Heidegger—he stole the show, I’m afraid. And it was a splendid opportunity to get Celan’s poetry, at least a little of it, in John Felstiner’s superb translations, on to mainstream radio. TEV: I'd like to talk for a moment about the physical book itself, which is a beautiful production. 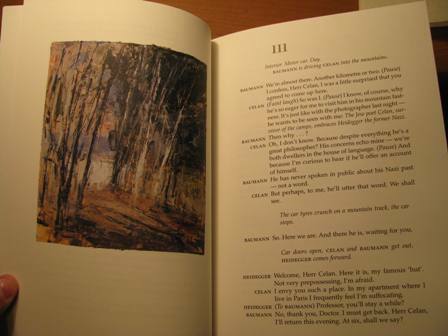 How did you become involved with The Gallery Press, and what discussions, if any did you have with the painter Donald Teskey, who provides the magnificent illustrations? JB: Gallery Press is one of the last great publishing houses—in this case, “house” is literally the word, since the entire operation is conducted at Peter Fallon’s home in the countryside in County Meath. Peter published the three Kleist versions, as well as reissues of a couple of my early fiction works, Long Lankin and Nightspawn. It’s a privilege and a real joy to have one’s work brought out so handsomely, and with such meticulous care and attention to detail. 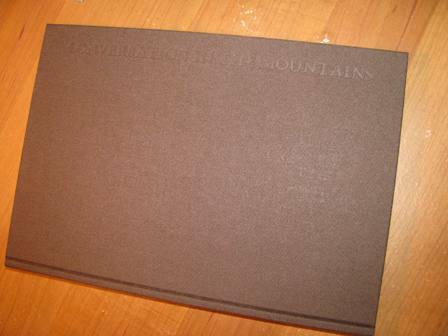 Conversation in the Mountains is a limited edition, and very beautiful, I think. Yes, I agree that Donald Teskey’s illustrations are wonderful, and perfectly in tune with the text. In fact, I had no contact with him at all: it was Peter Fallon who commissioned the pictures. I have one of the originals, a gift from Peter, framed on the wall above my desk. TEV: What is it about the German thinkers that has always seemed to resonate with you so profoundly? And how do you think they reach us today? JB: German literature, including philosophy, has been an abiding interest with me since I was a teenager. I find it exciting and challenging and, I suppose, a fascination since, having been born in 1945, I grew up in the long, ashen shadow of the concentration camps. How could such a culture end in such catastrophe? I’m still reading, still trying to find out. TEV: Finally, these days you're a novelist, a dramatist and a thriller writer. Who is having the best time of it? 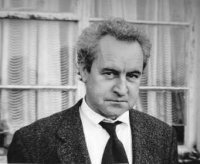 JB: Oh, John Banville has the most difficult task, but he still reaps the artistic rewards, and what else matters? You can order a copy of Conversations in the Mountains - while they last - directly from Gallery Press here. The book is a beautiful thing - I have one myself - a fine example of how these things should be done. So is your post, with information, photographs and that seasoning of fandom that makes for a top-class piece of litblogging. Incidentally, the price from Gallery is 100 euro rather than 100 pounds, making it even more of a bargain. 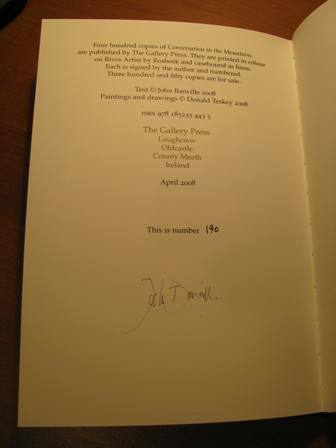 Spend the savings on Gallery's 'Complete Poems' of Derek Mahon. You won't regret it. Good stuff, Mark! I hadn't known that Banville did an adaptation of Loving - what a shame it isn't online! "How could such a culture end in such catastrophe? I'm still reading, still trying to find out." Take it from me that reading won't answer those questions, but live here for more than five years and you're less likely to feel that you're faced with a paradox in contemplating them. John Banville is right -- Ackland is a wonderful actor... so it's only proper to get his name right: Joss, not Josh. I agree with him about Felstiner, but I wouldn't want to forget Michael Hamburger's translations, either. Oh, much as I'd love to own it, 100 euro is a touch steep for me right now. Does anyone know if Gallery Press has any intentions to put out an edition similar to its Long Lankin, Birchwood, etc. editions?